The Lord of the Miracles is the most spectacular of Peru's thousands of religious festivals. 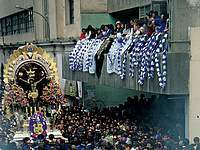 The annual 24-hour procession through Lima honours the venerated image of a black Christ, which was allegedly drawn by an Angolan slave on a wall in colonial times, and has survived all attempts to erase it, including an earthquake in 1746, which levelled all surrounding buildings. The painting, weighing two tons, is carried aloft from the church of Las Nazarenas across Lima to the church of La Merced in Barrios Altos. The procession consists of tens of thousands of believers, dressed in purple, singing hymns and praying. The route is lined with vendors offering traditional sweets and dishes. The festival also launches the Lima bullfight season at the Acho Arena in which toreadors contend for the coveted 'Golden Cape of Our Lord of Miracles'. It is enormously exciting and stirring to watch the procession and it is a wonderful time to be in Lima, as the city seems to come alive with celebrations and religious ceremony. Venue: Streets of downtown Lima. Date: 18, 19 and 28 October annually.